If you ever doubt what difference an artist can make in a community, consider Linda Meigs. The Omaha native has found a way to connect her love of history, art, and preservation in a labor of love project and site, the Historic Florence Mill in North Omaha, that is equal parts museum, gallery, installation, and gathering spot. In so doing , she has gifted one of Omaha’s oldest neighborhoods with an attraction and resource that, were it not for her, would probably have never happened. 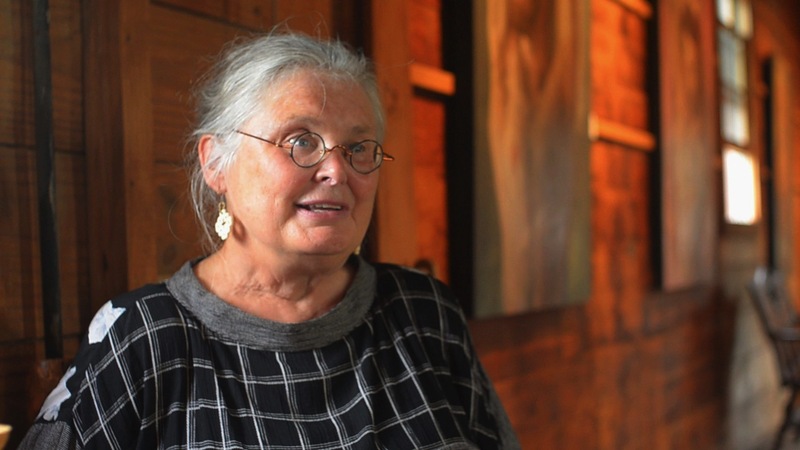 She saved the Mill, which has a rich history closely related to the Great Western Mormon Migration, from almost certain demolition and she’s lovingly preserved it as a landmark and transformed the site into a communal space that connects agriculture, history, and art. It is a story of one woman’s passion and magnificent obsession, which if you read this blog you know by now is the kind of story I love to sink my teeth into. You can find this story in the August 2014 New Horizons. Artist, history buff, preservationist Linda Meigs didn’t set out to be the Mill Lady but that’s what she’s known as at the Historic Florence Mill, 9012 North 30th Street. It’s appropriate, too, because ever since saving this landmark from likely demolition it’s been her baby. The wood structure dates back to the 1840s and boasts direct ties to the Great Mormon westward migration and to Church of Latter Day Saints leader Brigham Young. After near continuous use as a flour and lumber mill it was abandoned in the 1970s-1980s. Sitting vacant, the interior was exposed to the elements from a damaged roof and broken windows. Vandals released stored grain from the chutes. Heaps of matted oats and dried pigeon-rodent droppings covered the floors. Meigs acquired the Mill in 1998 when no one else wanted it. She purchased the-then wreck for $63,000 and much more than that has gone Into its cleanup, repair and restoration. The Mill’s become her magnificent obsession and all-consuming art project. Today, Meigs, 64, operates the site as a historical museum. Photographs, interpretive text panels, tools, implements, letters and posters tell the story of the Mill and the people behind it. Because she’s retained the historical character of the building, including original timber, the Mill also speaks for itself. The ArtLoft Gallery she created on the second floor is dedicated to her late son Connor Meigs, who followed her path to become an artist. He was a sophomore at her alma mater, the University of Kansas, when killed in a 2004 automobile accident. She was already six years into the project when he died and since then she’s only thrown herself more into it. An outdoor farmer’s market happens Sundays on the grounds, which she leases from the Nebraska Department of Roads. She also hosts special events at the Mill. This full-fledged cultural attraction began as a cockeyed dream that nearly everyone but her architect husband John Meigs tried talking her out of. It’s turned into a life’s work endeavor that’s preserved history, created a new community space and spurred tourism in one of Omaha’s oldest sections. Her efforts have earned recognition from several quarters. She’s owner, caretaker, curator and everything else there. She could have added market master. She “runs the show” at the Florence Farmers Market on Sundays in her gaudy market hat. Those roles are in addition to being a wife, mother and rental property owner-manager. The Mill though requires most of her attention. She’s glad to be in service to it, saying, “This is my gift to the city – to keep it open to the public.” She adds, “I’ve always been interested in preservation. My husband John, too. He worked on the restoration of the Orpheum Theatre and Union Station. We have a hundred year-old apartment building, the West Farnam, at 3817 Dewey Avenue. This intersection with history would probably have been razed if not for her passion and perseverance. The Mill’s been endangered several times, first by the people who built it, the Mormon pioneers, when they left their winter quarters settlement to journey west to Utah. Brigham Young himself supervised the Mill’s construction. But after serving its purpose for that caravan of faithful it was left to the Indians and nature. Scottish emigre Alexander Hunter was on his way to the California Gold Rush when he saw an opportunity to rescue the Mill. He rebuilt it. An employee, Jacob Weber, later bought it. 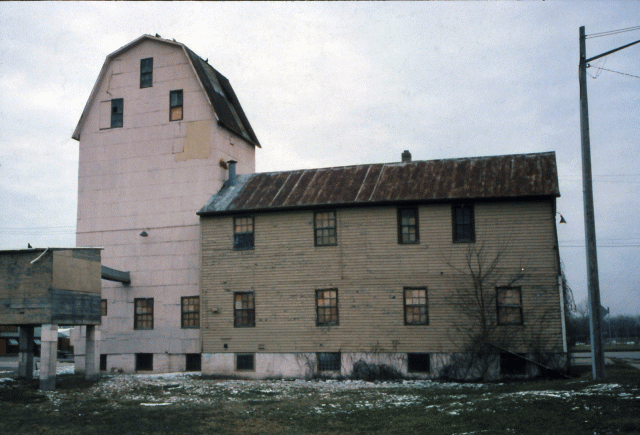 The Mill remained in the Weber family for more than a century, thus it’s often called the Weber Mill and Elevator. A 1930s flood nearly claimed it. The threat of future floods motivated Jacob’s grandson, Lyman Weber, to move the building, intact, to higher ground. In 1964 the Webers sold out to Ernie and Ruthie Harpster. Interstate 680 construction in the 1970s was slated to run right through the property before Ernie Harpster secured historic status for the site, which necessitated the Interstate being re-routed around it. Meigs first learned of the Mill when Haprster put it up for sale in 1997. Despite its awful condition Meigs saw potential where others saw ruin. “My role was to have it make a career change from an obsolete mill and grain elevator into a cultural site. And it took me years to figure out what its theme was, and it was just in the last year or two I recognized the obvious – it connects agriculture, history and art. I never would have thought I’d be able to choreograph my life so that those very separate things would come together in anything as good as this building. It’s like they all tied together in this serendipity project. Indeed, it’s unlikely anyone else possessed the necessary skills and interests, plus will and vision, to take on the Mill and repurpose it. The oldest of three siblings, Meigs is the only daughter of Francis and Pauline Sorensen. Her parents grew up on north-central Neb farms. Linda spent her early childhood in the Dundee neighborhood, where she and John have resided since 1975, before her family moved to southwest Omaha’s Sunset Hills. Though she grew up in the city, Meigs gained an appreciation for agriculture visiting her maternal grandparents’ farm. “My mother’s family farm was my second home. We went out there weekends and holidays. In fact. 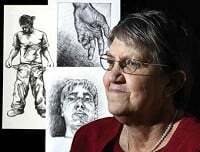 I’ve used it for my artwork quite a bit,” says the veteran visual artist who’s shown at the Artists Cooperative and Anderson O’Brien galleries. In contrast to this bucolic idyll was her “Edgar Allan Poe childhood.” Her mother sang at funerals and Linda accompanied her to the dark Victorian gothic mansions where these somber services were held. Meigs traces her love of old buildings to those times. Her talent netted a scholarship to the University of Kansas art camp, but her parents couldn’t afford to send her. Heartbroken though she was she still fixed her sights on studying art in college. She started at the University of Nebraska-Lincoln before switching to KU. The state university in Lawrence proved a good fit. Her insurance adjustor father and homemaker mother never opposed her pursuing art. She and John made a go of it after marrying in 1975. He worked as an architect for Leo A. Daly before going into the building supplies business. She worked in a design studio before going off on her own as a freelance illustrator. She’s taught art at Joslyn and Metropolitan Community College and more recently with Why Arts? She kept her hand in art in other ways, too. “I was the cultural arts chair of Washington Elementary School for nine years. I invented a theme every year. The first one was Artists in Our Midst and every month I brought in a different artist. Whether they did pottery or silkscreen or painting, there was an artist in residence in the hallway demonstrating their work. I leaned on my artist friends for that to make this program for the school. Her and John’s appreciation for history developed into a hobby of driving around to admire houses and buildings in the old parts of town. Then in 1997 she saw an Omaha World-Herald article that changed her life. Headlined “History for Sale,” it detailed the Mill’s colorful past. Having come to the end of its commercial life, the Mill was for sale. “When I read the article I had a sinking premonition it (the Mill) would be my job,” she says with a laugh. When she and John toured the Mill for the first time it marked her first visit to Florence. The building was a mess. “It was boarded up and pitch black inside. We used flashlights to see. It had 2,000 pounds of fermented grain in a bin. Another 12,000 pounds were on the floor. We shuffled through piles of grain, dirt, dead animals and pigeon poop. It was stinky, dark, scary and unhealthy in there. It wasn’t too far gone for Linda, though. Not by a long shot. For Meigs, the Mill is a living history lesson. She says the original hand-hewn timbers felled and erected by the Mormons are intact, as are the timbers Alexander Hunter used in rebuilding it. The circular marks from Hunter’s saw are visible in the timbers. There are vintage signs, pay stubs and time cards about. Getting things up to code meant addressing myriad problems, from fixing huge holes in the roof to replacing rotted windows to draining fetid water in the basement she called “a stinky swimming pool” to removing seven tons of gunk. Her first order of business was cleaning all the walls and floors and open surfaces – “I scrubbed the entire building with trisodium phosphate and a brush” – and repairing the leaking roof. She got a pleasant surprise when she discovered all those strewn oats acted as a sealant that protected the wood floors. “So the bane of the building was its blessing,” she says. It wasn’t long before she got a sense the Mill just might be the attraction she thought it could be. “That first summer I was in here cleaning I had a thousand visitors and it wasn’t even open. Actually the Mill told me through all those visitors that it needed to be open as a historical site. I had very vague ideas what to do with it. It’s an odd building functionally. As an artist I thought there would be a good gallery space here. Meigs may have come to Florence as an outsider but she soon established herself as a good neighbor dedicated to building community and boosting economic development. The Mill’s open seasonally, May through October. It goes in hibernation for the winter as it’s without heat and indoor restrooms. Although still a newcomer to Florence, she’s become one of its biggest champions and feels it’s often overlooked considering its rich history. She chaired the group Florence Futures that developed the master redevelopment plan for the Florence neighborhood. When the Mormon Winter Quarters Temple opened she organized a Lunch in Historic Florence event that gave visitors to the Temple a button for a discounted lunch at area restaurants. “It was the first time the community had done a project with the Temple,” she says, adding the promotion won a state tourism award. Much sweat equity and money went into getting the Mill into its present restored state. With no paid admission, the trickle of income from vendor rentals and gift shop sales isn’t nearly enough to keep the Mill open and maintained. She depends on grants and donations. She and John also “pitch in money to keep this afloat.” She estimates more than $300,000 has been invested in the building thus far from various sources. Some major donors have come through for pricy projects, such as automatic barn doors. The Peter Kiewit Foundation and the Lozier Corporation helped fund their purchase and installation. She’s proud of how she converted the mill’s loft into a rustic art gallery bathed in natural light. The space didn’t become a full-fledged gallery though until her son Connor’s death. Connor was an award-winning editorial cartoonist with the Omaha Central High Register and the Daily Kansan. He was home for the holidays, driving with his twin brother Doug, when the collision happened near the south side of Elmwood Park. “We were over at John’s parents’ house waiting for Doug and Connor to come over to play board games with us,” says Linda. “The roads turned to black ice. Both boys suffered injuries and lost consciousness. There was a huge outpouring of support, including $10,000 in memorial gifts to the Mill. She also wanted to do something to commemorate his love for art. The Connor Meigs Art Award is a merit award to help launch a young artist’s career. It includes a month-long solo exhibit, mentoring, artist’s reception, lodging and $1,000 honorarium. Because Connor was an organ donor his mother knew he helped give life to others and would live on through the recipients. Linda had been waiting for a letter but she got a personal visit instead. Historically, the Mill’s always been a landmark for travelers. whether on foot, by wagon or motor vehicle, and it remains a magnet for all kinds of visitors and events. Warren Buffett’s been there. The grounds have accommodated campers following the Mormon Trail. it hosted a Great Plains Theatre Conference program in May that drew hundreds. Each fall it’s a site on the North Omaha Pottery Tour. The gallery hosts several exhibits annually. The farmers market features dozens of vendors on Sundays from June through September. Meigs says the Mill gets 8,000 to 10,000 visitors each summer and the farmer’s market, begun in 2009, is a major draw. It’s an eclectic scene where you can listen to live bluegrass music and get a massage. Children can ride ponies and pet alpacas. Linda sometimes joins the circle jam of fiddle and dulcimer musicians to play the washboard. The laid-back vibe is largely attributed to Meigs. She feels she’s part of a long lineage of people who have been entrusted with the Mill. Meigs doesn’t have a succession plan for handing-off the Mill when she retires or dies. She says the Douglas County Historical Society or the Nebraska State Historical Society may be possibilities. She even thinks there’s a chance the Mormon Church might have interest in it. She’s not giving it up anytime soon, though. Besides, she’s become so identified with it that she and the Mill are synonymous. For Mill hours and activities visit http://www.theflorencemill.org. Great article-proud to call Linda both cousin & friend! Star-studded lineup of artists at North Omaha Summer Arts Crawl – Friday, August 8 from 6-9 pm Arts Crawl Concludes North Omaha Summer Arts; Friday, August 8 from 6-9 p.m.